Of the hundreds of thousands of soldiers who died in the Civil War, two-thirds, by some estimates, were felled by disease; untold others were lost to accidents, murder, suicide, sunstroke, and drowning. Meanwhile thousands of civilians in both the north and south perished—in factories, while caught up in battles near their homes, and in other circumstances associated with wartime production and supply. These “inglorious passages,” no less than the deaths of soldiers in combat, devastated the armies in the field and families and communities at home. Inglorious Passages for the first time gives these noncombat deaths due consideration. 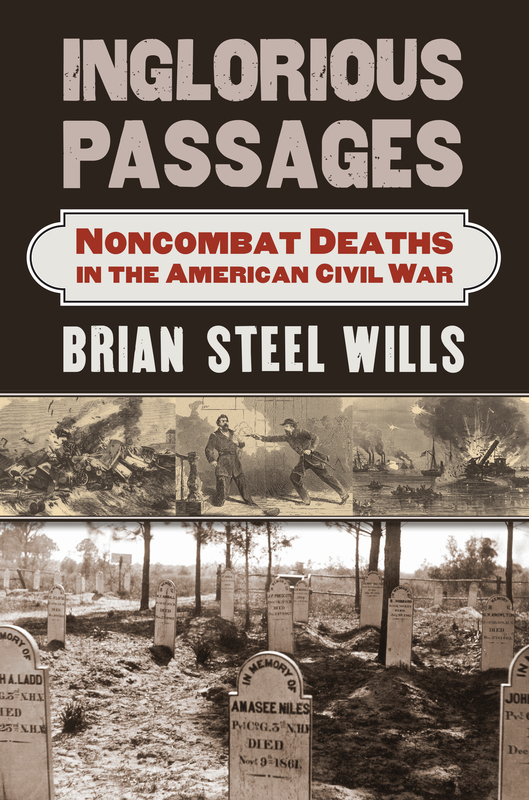 In letters, diaries, obituaries, and other accounts, eminent Civil War historian Brian Steel Wills finds the powerful and poignant stories of fatal accidents and encounters and collateral civilian deaths that occurred in the factories and fields of the Union and the Confederacy from 1861 to 1865. Wills retrieves these stories from obscurity and the cold calculations of statistics to reveal the grave toll these losses exacted on soldiers and civilians, families and society. In its intimate details and its broad scope, his book demonstrates that for those who served and those who supported them, noncombat fatalities were as significant as battle deaths in impressing the full force of the American Civil War on the people called upon to live through it. With the publication of Inglorious Passages, those who paid the supreme sacrifice, regardless of situation or circumstance, will at last be included in the final tabulation of the nation’s bloodiest conflict. Brian Steel Wills is professor of history and director of the Center for the Study of the Civil War Era at Kennesaw State University. His many books include George Henry Thomas: As True as Steel and The Confederacy’s Greatest Cavalryman: Bedford Forrest, both from Kansas.